The Real Housewives of Beverly Hills served us drama in the Season 9 premiere last week. It looks like the season centers around a nasty squabble between former (?) friends Lisa Vanderpump and Kyle Richards. Obviously, this is not the first time the two have shared a mutual disagreement. Still, the argument peaked when Lisa’s husband Ken Todd accused Kyle of being a “f-ing liar.” Then, he dismissed her from Villa Rosa. We have never seen Lisa and Kyle go at it quite like this before. Could it be the end? Kyle discussed her side of the story and how surprised she was at Ken’s vitriolic reaction. In her blog, Brandi Glanville took the opportunity to insult most of her co-stars and compare part two of the Real Housewives of Beverly Hills reunion to a football game. Together, Brandi and Kim Richards were the ball, right? Brandi brought the air and Kim brought the leather. That’s quite clever. Good for them. After watching tonight's episode of Real Housewives of Beverly Hills, Cedric Martinez felt it necessary to reach out and share his side of the Lisa Vanderpump vs. Brandi Glanville drama. Cedric wants to set the record straight, while slamming Lisa and Ken and the show overall. Cedric shares via his rep, "Tonight’s episode shined the spotlight on Lisa and Ken’s habitual lying and viciousness. It would be easy for me to say “I told you so,” but that’s not my style. But I do want to clear up the ​nasty deportation ​rumor. Brandi​ is brutally honest and I love it. Most of the time she says exactly what everyone else is thinking. But sometimes she tells little white lies to amp up the drama. That's where things get complicated. Cedric's side of the story: "It all started with the entirely scripted lie that "Me and Cedric are friends from modeling." The producers concocted the fib to get her on the show. Brandi, Lisa and I sold it, and the rest is history… Brandi's a star​ and I was kicked to the curb. At the time I was furious. I'd just been betrayed and fired because of Lisa's​ vicious lies. I was naïve; expecting Brandi to do the right thing and support me, as I had supported her. Instead, she dropped me like a hot potato. In hindsight, I'm O.K. with it because I know Lisa forced Brandi to cut me off." I don't even know what to say about this so I'm just gonna report the information and let y'all brilliant readers have your way with it. 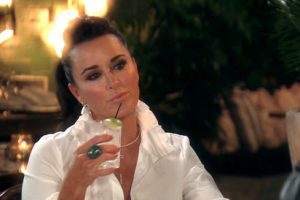 Kim Richards is all riled up because Lisa Vanderpump RSVP'd no her daughter's graduation party and then… wait for it: didn't show up! But she sent a gift. #Witch Now she has declared war on her Real Housewives of Beverly Hills castmate! ​Kim is able to forgive Brandi Glanville for calling her a meth addict on national TV and telling people she pooped on her pillow, but not forgive Lisa for decorum and the truth came out on twitter! Kim is now Brandi's friend and Brandi and Lisa are now NOT friends. In fact, according to the wisdom of Kingsley Kim, everything bad that has ever happened on RHOBH like in the history of the show is ALL LISA'S FAULT. A viewer recently tweeted Kim warning her about trusting Brandi, stating: "Look what she did to Lisa." and Kim responded with, “What did Brandi do to her? I KNOW!! Brandi says stupid things things!! But … I PROMISE U!! EVERYTHING LISA DOES IS FOR A REASON!! …..NEVER JUST BECAUSE SHE LOVES ❤U" Basically it's the same old-same old "playing chess" nonsense that Kyle Richards has been spewing for ever. You may not agree, but I think Brandi Glanville is the spice so needed for Real Housewives of Beverly Hills. She's brash, she's offensive, she's everything her counterparts want to be but pretend that they're not. You add in the fact that Brandi's ex-husband Eddie Cibrian couldn't keep it in his pants, and she proceeds to run into his former mistresses throughout 90210, and you've got a great reality recipe for drama. I know y'all recall the SUR party last season (you know, the one Cedric Martinez tried to crash, not to be confused with this season's Villa Blanca party when Adrienne Maloof sent that passive aggressive jungle arrangement to Lisa Vanderpump) when Brandi ran smack dab into SUR waitress Scheana Marie who had once gotten to know Eddie really well…if you catch my drift. Fast forward to Scheana starring in Bravo's new Vanderfabulous spin-off Vanderpump Rules, and she's all over the media yet again for that unfortunate run in with Brandi. Of course, Brandi handled the situation with as much class as Brandi can…she did a better job than I would have expected. From previews, we know that the women will come face-to-face yet again (thanks producers!) to finally say their peace, and now media outlets are revisiting that original awkward meeting as Bravo hypes its newest reality show. 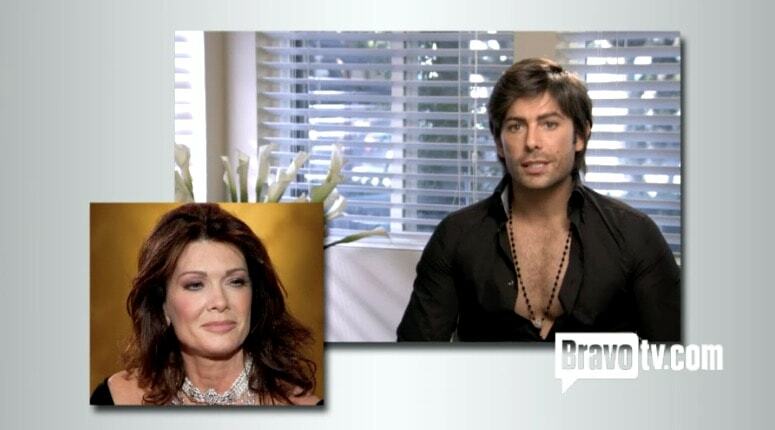 Details From Lisa Vanderpump’s SUR Spin Off! Camille Talks Returning To The Show; Plus Is Brandi RHOBH’s New Mean Girl? If you watched last season’s Real Housewives of Beverly Hills, you know that Lisa Vanderpump owns quite the restaurant scene. On the episode where the dastardly Cedric Martinez showed up to confront his former friends/personal ATMs at the opening of SUR, Brandi Glanville had an awkward near run-in with a young lady Eddie Cibrian “dated” before cheating on his wife with Leann Rimes. Villa Blaca and SUR waitress (slash actress slash model slash pop star) Scheana Marie was mortified to see Brandi at the event because she had gone out with a wedding ring-less Eddie who claimed to be single. Because that scene on the show was a mere minute in a half long, by my calculations, Scheana Marie thinks she’s got at least thirteen minutes left.